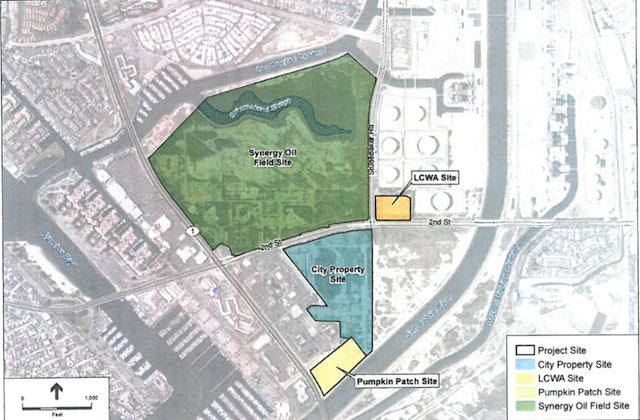 Under the proposed deal the City of Long Beach would regain over 150 acres of wetlands (green) area. An oil company would be allowed to establish new wells at the pumpkin patch and LCWA sites. File photo. State officials Wednesday approved a zoning amendment that could allow a controversial deal in which Long Beach would trade land with an oil company to consolidate oil operations while simultaneously restoring portions of the Los Cerritos Wetlands. The 10-1 vote by the California Coastal Commission follows the City Council approval of the plan in January. Because the plan sits in the coastal zone, it required approval from the coastal commission before the city could move forward with its rezoning efforts. Councilwomen Lena Gonzalez and Jeannine Pearce were the only members to vote against the project earlier this year. By amending the the city’s local coastal plan, the deal between the city and Beach Oil Minerals Partners is one step closer to completion. Under the plan, Synergy Oil field, currently located northeast of the of the intersection of Second Street and Pacific Coast Highway and operated by the Beach Oils Mineral group, would be transformed back into wetlands. The process is expected to span over 40 years as the group works to restore about 150 acres of the wetlands. In return, Beach Oil Minerals would be allowed to acquire and develop new oil wells on a previously city-owned parcels that had been used for a seasonal pumpkin patch, and at the current Los Cerritos Wetlands Authority site to the east of the old field. The two sites would be connected by a 2,200-foot above ground oil pipeline. The coastal commission’s vote allows for the zoning amendment change, but the actual parameters of any future drilling on the new sites will be determined at a separate hearing before the commission, perhaps as soon as October. Commissioner Roberto Uranga, who also represents Long Beach’s seventh council district, said the project provides an opportunity to transform a large portion of land that is currently privately held and can be used for continued oil production for an unrestricted amount of time. Commissioner Steve Padilla agreed that this may be the commissions best chance to rehabilitate some of the state’s wetlands, although he disagreed with what he framed as a Hobson’s choice, a choice where only one choice is offered. It’s expected that the bulk of the removal of old rigs and equipment will occur in the first few years of the deal, but the phasing out of old wells will take place over a 20- to 40-year period. Two commissioners expressed a willingness to address the time frame in which restoration would be carried out, stating that 40 years was a “concerning” amount of time and that they would seek to tighten the window at the commission’s next hearing on the project. Supporters of the project touted its ability to shrink oil production in that portion of the city from about 187 acres to 10 acres and for its potential to create over 150 acres of restored wetlands. Since the early 1900s, the wetlands area in Long Beach has been systematically squeezed by developments shrinking from its original 2,400 acres. Opponents pointed to what they believed were impending environmental disasters that they said will accompany the development due to its proximity to an active fault line. They called for an expedited clean up of the site, with some demanding that happen without any more oil well developments. Others took issue with the city’s position that the restoration of the wetlands could serve as a facelift to prominent entry points to the city while simultaneously installing oil rigs that would extend over 100 feet into the air for a 14-year period. While most agreed that wetlands and habitat rehabilitation was a good thing, they spoke nearly in unison in regard to what they felt this project really represents.